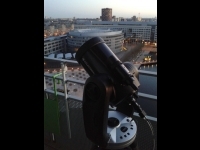 A view of my observing location on a 15th floor balcony facing SW in central The Hague, Netherlands. Featuring my Celestron CPC 800 XLT with Flea3 attached. Captured a shot of the EWI building at TU Delft from about 7 km distance. Taken at f/5, stacked 250 frames in Registax. 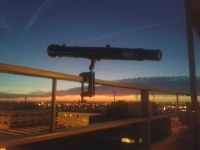 Finally found a gadget to attach the Galileoscope to the balcony railing like I envisioned it. 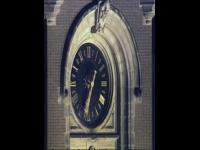 Clock of peace palace in The Hague, imaged at night from 2.5 km distance. 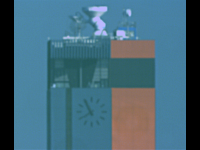 Stacked 100 x 600 ms exposures. Unless otherwise stated, all astrophotos were taken with a Celestron CPC 800 XLT (8″ f/10 SCT) using a Flea 3 camera (FL3-GE-13S2-C). Copyright (C) 2006-2013 by Christian Fröschlin. Please note the legal disclaimer. If you experience problems with this page, contact webmaster@chrfr.de.